We look forward every year to when we honor San Diego women business owners who've established themselves as leaders and role models. This luncheon will begin with a no-host cocktail hour, followed by a gourmet meal and an exciting fireside chat with Mara Fortin moderated by RJ Kelly. Mara is an attorney, small business owner, political advocate, philanthropist, community leader and, most importantly, a mom. She has three children, two teenage daughters and a six month old son. 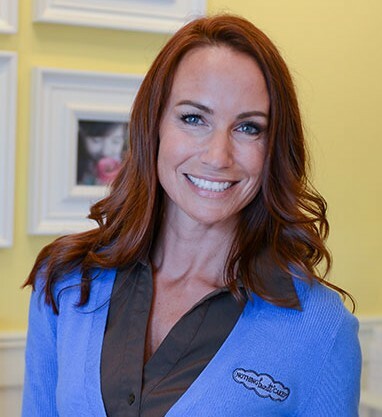 Mara is the first franchisee ever to open a Nothing Bundt Cakes bakery, and is now the largest in the nation, with seven. We are very excited to have her speak with RJ Kelly for an insightful fireside chat! Our venue is the Cape Rey Carlsbad, a beautiful facility nestled along the sunny Pacific Coast in northern San Diego, that features free self parking. In addition to attending what promises to be an unforgettable event, you have the chance to participate in the 2018 BRAVO! Awards in several other ways. Click here for our list of nominees. Your support of the 2018 BRAVO! 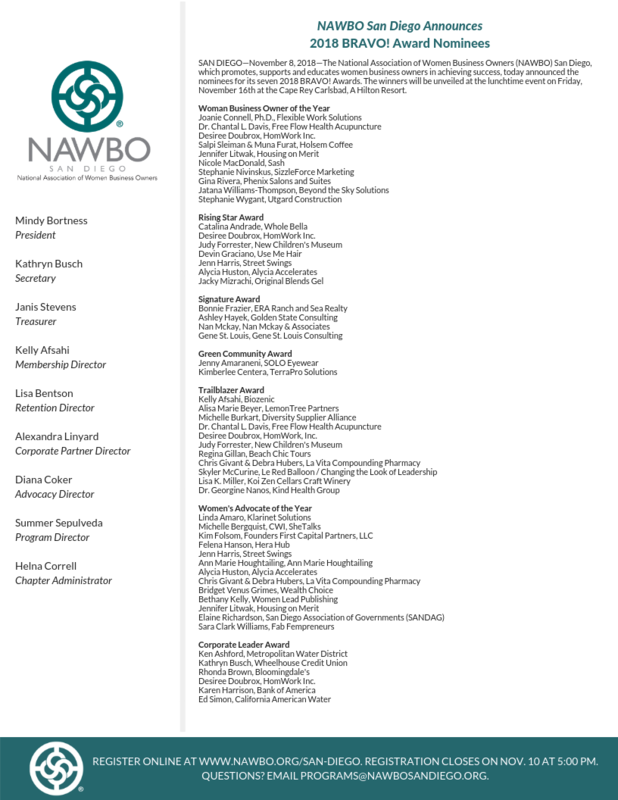 Awards will help us produce a fantastic event, the proceeds of which will benefit NAWBO San Diego to continue its programs that would benefit women business owners and achieve its mission to empower women business owners and help propel business growth. Click to download our SPONSORSHIP OPPORTUNITIES FORM. Help us make the 2018 BRAVO! Awards the BEST EVER! Please complete and email your COMMITTEE SIGN-UP FORM to membership@nawbosandiego.org. Don't miss out on this spectacular event recognizing and honoring women business owners and corporate leaders of their accomplishments and contributions to the community! Regular pricing is available until November 10. Save your spot now! Click the button below to register as an individual, purchase a table, or submit your sponsorship.